The Beer Critic Beer reviews for beer enthusiasts. Crisp and clean this beer hits the spot on a hot summer afternoon. Brooklyn Brewery have a great job at making a beer that is light enough for good drinkability yet flavorful enough to not get boring. Appearance: Color is a crystal clear, pale golden yellow. Poured with a fizzy one finger head that dissipated quickly leaving little to no lacing. Smell: This beer has a soft and clean bouquet. Along with some subtle hoppiness there is a nice amount of doughy/biscuit scent. Just what you would expect from a refreshing summer beer. Initial Taste: Very nice and clean with a perfect balance of slightly bitter hops and sweet bready malts. Along with a great combination of sweet and crisp there is good amount of lemon. The lemon adds a nice zest to the beer making it quite refreshing. Very little aftertaste. Thoughts: Crisp and clean this beer hits the spot on a hot summer afternoon. Brooklyn Brewery have a great job at making a beer that is light enough for good drinkability yet flavorful enough to not get boring. While I’m not usually a big fan of lemon flavored beer this one made the grade. The lemon was only strong enough to add that refreshing zip that makes this so good for dealing with summertime heat. And down here in SW Florida….there is plenty of that. If you like summer style beers you owe it to yourself to check this one out. Cheers! Previous: Spring is in the Beer! I actually enjoy this beer. I think it is a great summer brew, but actually I think I could enjoy this on into the fall season. Brooklyn is one of those breweries that I just seem to pass up when I’m looking for beers. I think its because they are so easy to find and I take them for granted sometimes. I’ve liked a lot of their other beers, so I’m thinking I’ll give this one a try this summer too! I thought their Brooklyner Weisse was excellent! Also a great beer for Summer! 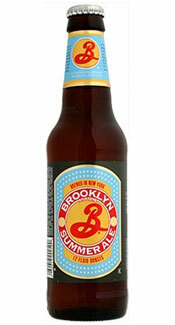 Sounds interesting, wish I could find Brooklyn Brewery beers in SoCal here. I hear good things generally about their beer. Also I saw the brewmaster on Wine Library TV and he seemed like a cool guy. This style to me is wildly overrated, but when someone makes a drinkable and simultaneously complex expression of the style I do take notice. @Scott Honestly I haven’t been a big fan of Brooklyn Brewery though I have not tried them all. I did like their Brown Ale but it’s not a “go-to” beer of mine. @Royce I agree that this style can get overrated. In truth any Pilsner or wheat beer could be considered a “Summer” ale, no? But what is life without marketing. lol Thanks for your comments! Great beer, bro! One problem though! Alcohol content is coming in low! Say it ain’t so! Drink a sixer and you’re still absent of the elixir. Seek higher potency goods, my friend, for a proper buzz! Summer Ale – Shipyard Brewing Co. Lunch is now my favorite meal! We are not affiliated with any brewery mentioned on this website. Copyright 2013 Website by Avant Innovations a Fort Myers Web Design Company.